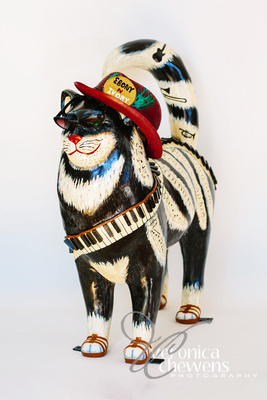 Description: This cool cat is black and white, naturally. 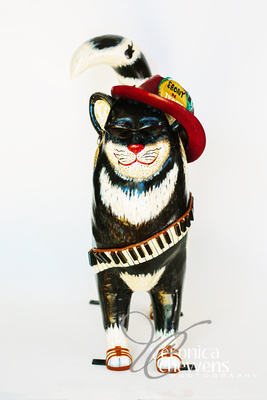 You can “tickle the ivories” on his tail adorned with 3-D piano keys. 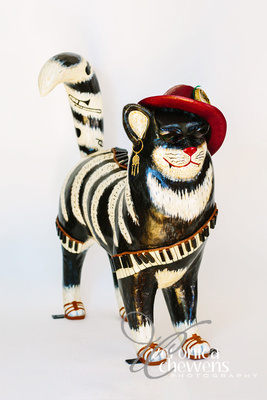 Hand-painted songs about cat (of course) are his stripes. Similar to “Cat-a-nooga Choo Choo” in 2016 and “Frosty the SnowCat” in 2015, the tunes & lyrics will be actual musical charts that can be read & played – not just random notes. About the Artist: Participating in Cat’n Around Catskill, for a number of years, Theresa Rowe Obert is eager to be involved in the 2018 public art season. Last summer, “Strawberry ShortCat” and “Checkered Cheetah” were among her entries in addition to “Purple Pussycat”. A former resident of Greene County, she has been involved with public art exhibits for Coxsackie, Ravena-Coeymans, Greenville, Cairo, Saugerties, and on the Mountain Top. She graduated from Windham-Ashland-Jewett Central School, Ladycliff College and Fordham University holding a B.S. in Art and M.S. in Education. After teaching elementary art and academic subjects for a number of years, she was a freelance artist for publishing companies, taught adult ed. classes and worked with senior citizens. Currently she resides in Connecticut.